Favorite Position: One “slice of bread” in a Morning Gory/Skate Trooper sandwich — you don’t wanna be THAT meat!! Injuries: I broke my leg at a practice prior to getting on the league-three months to the day before tryouts! EEK! Thank goodness for good PT and my “derby trainer,” Pris Toff! Motto: There’s no H in winning. Favorite Drink: Widmer hefewiezen — extra cold with a lemon, please. Coming from a sports background it has been very rewarding to learn a new sport and challenge myself in ways I thought no longer possible. 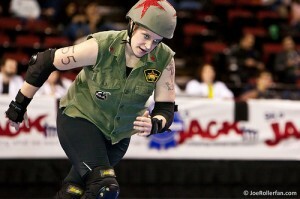 RCRG has taught me the value of being strong-both physically and mentally. Playing derby is something that has fine-tuned every notion I ever had about myself. It’s been a relief to finally feel okay about being “tough”, weighing more than 165 pounds and standing up for myself…in a world where the picture-perfect woman is typically none of those!